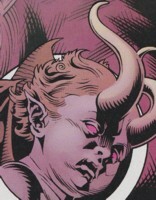 Powers/Abilities: Underchild is a minor tripartite demon with the power to dampen magic abilities and conceal them from others. Dormammu had vastly enhanced Underchild's magic concealing abilities, enabling the demon to even hide magic energies from Earth's Sorcerer Supreme. 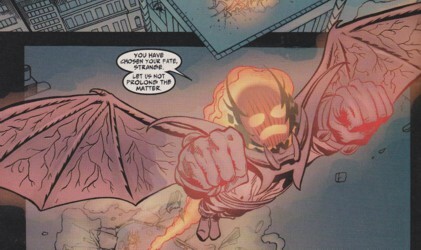 As part of Underchild's deal with Dormammu the demon infected humans with mystical energies connected to Dormammu, which possessed the humans and made them loyal to Dormammu or his followers. These powers originally spread among humans by touch until a certain energy level was amassed. After that point the energies spread to anyone within an infected human's vicinity. Underchild rode demonic swans and used magic horns that generated a deafening sound with a single blow. (Doctor Strange: Flight of Bones#1 (fb) - BTS) - <Twelve years ago> Underchild, the magic concealing tripartite demon, formed an alliance with Jonathan White, a mutant with the power to imbue others with magic abilities. 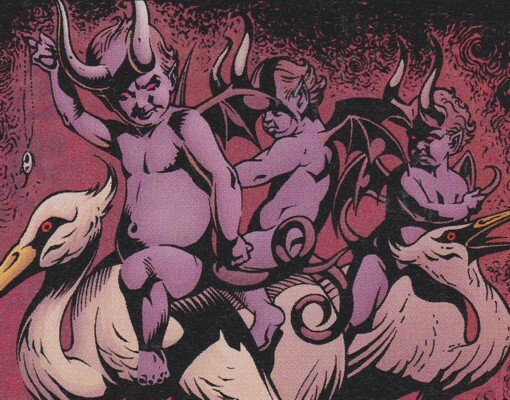 (Doctor Strange: Flight of Bones#4 (fb) - BTS) - Underchild was worshipped by the cult formed by Jonathan White. (Doctor Strange: Flight of Bones#1 (fb) - BTS) - Over the years Underchild concealed the magic of all those White had empowered. (Doctor Strange: Flight of Bones#4 (fb) - BTS) - Dormammu, unable to enter Earth's dimension, struck a deal with Underchild. Dormammu enhanced Underchild's power and in return Dormammu's essence became bound to Underchild's tripartite form. Working for Dormammu the Underchild spread his mystic energies while concealing the magic powers Jonathan White imbued his followers with. (Doctor Strange: Flight of Bones#1 - BTS) - When Dr. Strange investigated the mystical bank robbery at First National the Underchild's powers still concealed the magic from Strange, who could see that it obviously was a sorcerer robbing the bank, but couldn't sense any magic residue as he normally would. (Doctor Strange: Flight of Bones#1) - Underchild, summoned by White and his students, appeared at the ZenSational Yoga & Meditation Center in White's class and approached his newest student Topaz, who fell under their influence and was given a medallion to conceal the magic White had imbued her with. Later that night Underchild entered the home of one of White's cultists and used his magic concealing powers on him shortly before White imbued him with magic powers and activated them. According to White the empowering of this man completed the circle of his apostles. (Doctor Strange: Flight of Bones#1 - BTS) - The robber from earlier hijacked a car after killing the driver and crashed it into a church. The police caught up to him when the robber entered the church, creating a possible hostage situation. Hearing about it on the police radio Dr. Strange went to the church, but Underchild's magic concealment still worked on the robber. Dr. Strange was unable to save the robber, whose magic powers killed him in an explosion. (Doctor Strange: Flight of Bones#2 - BTS) - Three sorcerers empowered by White with their powers concealed by Underchild's powers attacked Dr. Strange when Topaz lured him to them. (Doctor Strange: Flight of Bones#2) - Underchild appeared after Dr. Strange defeated the sorcerers. Underchild blew a magic horn until Dr. Strange's ears began to bleed. The surprised sorcerer retreated, taking Topaz with him, but she turned on him and tried to kill him, using the magic powers White had given to her. Strange broke the evil influence over her and freed her of it before one of the sorcerers knocked him over the head and Underchild managed to get a hold of Topaz and flew her back to the mediation center. Though Underchild escaped with Topaz Strange managed to capture the sorcerer that had hit him. At the Sanctum Sanctorum Strange interrogated the man, but due to magic locks he was unable to tell him anything. When the magic powers given to him by White killed him Strange picked up his last thoughts, which revealed White's name to Strange. (Doctor Strange: Flight of Bones#3 - BTS) - Dormammu's mystic energies and influence possessed more and more people and now spread even without touch among the people of New York City. (Doctor Strange: Flight of Bones#4 (fb) - BTS) - Underchild showed White how to put a magically irremovable metal charm next to a human heart to make White's magic power tweak permanent. (Doctor Strange: Flight of Bones#3 - BTS) - Underchild's powers still concealed the powers of White's apostles when Dr. Strange arrived to take down Jonathan White. Dr. Strange defeated White's disciples while White summoned Underchild. (Doctor Strange: Flight of Bones#3) - Underchild appeared at the medidation center and was going to use his sonic trumpet attack on Strange again when Strange magically shut the mouths of the tripartite demon. Unable to use their most powerful attack on the Sorcerer Supreme Underchild's true master Dormammu forcefully merged the demon's form with the mystic energies spread among the people of New York City to reform his physical form on Earth to the shock of Strange, Topaz and White. (Doctor Strange: Flight of Bones#4) - Dr. Strange fought Dormammu and ultimatley split his physical form, still bound to the Underchild, apart with by summoning lightning. While Dormammu still possessed Underchild and threatened Dr. Strange the sorcerer infected him with a costum-designed airborne mystic virus he had created to negate Underchild's influence. The demon grew sick and with Underchild's influence broken the energies, which had enabled Dormammu to stay on Earth, dissipated. Without the energies keeping a portal to Earth open Dormammu was once again banished from Earth. Underchild's form dissipated in front of Dr. Strange, Topaz and White's followers, who had no recollection like all the other people of New York that had fallen under Dormammu's influence. Comments: Created by Dan Jolley (story/script), Tony Harris (story/pencils) & Ray Snyder (story/inks). Jonathan White had the power to tweak a human's nervous system to instantly give them magic powers. Because his clients lacked a true sorcerer's resilience years of training built up White had to untweak his clients within ten hours after activating their magic abilities or else they would burn out and die. (Doctor Strange: Flight of Bones#1 (fb) - BTS) - <Twelve years ago> Jonathan White, a mutant with the power to imbue others with magic abilities, formed an alliance with the magic concealing demon Underchild. Over the years White imbued many followers with magic abilities, which were concealed by Underchild. (Doctor Strange: Flight of Bones#1 (fb) - BTS) - Wendy joined Jonathan White's meditation course and became imbued with mystic powers and the Underchild's concealment magic. (Doctor Strange: Flight of Bones#4 or 3 (fb) - BTS) - Underchild also transferred part of Dormammu's essence into her. (Doctor Strange: Flight of Bones#1 - BTS) - One of White's magically empowered cultists robbed a bank, murdering several bystanders with energy blasts. (Doctor Strange: Flight of Bones#1 - BTS) - After visiting his course for one week Wendy convinced her friend Topaz to attend the course as well. Reluctant at first Topaz joined Wendy, who transferred some of the energies she had gained through the Underchild and White to a man walking by when she touched his arm. Moments later they entered the ZenSational Yoga & Meditation Center. (Doctor Strange: Flight of Bones#1) - White welcomed Wendy and her friend to the course and told them that he had saved a couple of spaces for them. White then started to meditate with his students and Topaz. During the meditation White and his students started to chant, summoning their master Underchild in the process. Fallen under the influence of White and Underchild Topaz accompanied White to one of his apostles. White explained to Topaz that he and Underchild had to take extra measures with Topaz because she was very powerful already and they couldn't risk her turning on them if they couldn't convince her to join their cause. Topaz only wanted to know how fast they could act and White revealed that they would act soon because with that night's inductions their brethren numbered in the millions and his circle of apostles was complete with the man he was going to induct later. White realized the threat Strange posed to him, but he had already sent a sorcerer, the robber from earlier, to distract him for the rest of the night. White then activated the magic powers in the man he was visiting that night. (Doctor Strange: Flight of Bones#2) - White's touch passed on the influence of Dormammu to random people on the street. (Doctor Strange: Flight of Bones#2 - BTS) - White sent Topaz back to Strange to lure the Sorcerer Supreme into a trap. Though Strange defeated the three sorcerers sent after him by White and Underchild, he was surprised by the latter's sudden appearance and attack. While Strange fled with Topaz she turned on him, but her attempt to kill him failed. Strange broke White's evil influence over her, but was then hit over the head by one of the three sorcerers. Underchild abducted Topaz while Strange caught the attacking sorcerer and took him to the Sanctum Sanctorum for interrogation. Mystic blocks in the sorcerer's brain prevented him from telling Strange about White until the powers given to him by White killed him. His last thoughts revealed Jonathan White's name to Dr. Strange. (Doctor Strange: Flight of Bones#4 (fb) - BTS) - After Strange had broken the medallion, and therefore the evil influence over Topaz, Underchild didn't want Topaz to survive the activation of the powers White imbued her with and showed White how to put a metal charm next to her heart to make the transfer permanent. (Doctor Strange: Flight of Bones#3) - Back at the medidation center White explained to Topaz his powers and that he needed to remove the powers within ten hours or else the empowered died. Topaz wasn't too impressed with the mutant working with a demon and asked if the robberies where just a distraction. White replied that he didn't tell her everything to understand his plans, but to make her understand what was going to happen to her because he had empowered her already. White then implanted a metal charm provided by Underchild right next to Topaz' heart. The other cultists had never seen White do something like this before. Topaz collapsed in front of him and White revealed that to activate her powers she just had to say she accepted them. Unfortunately he couldn't let Topaz back into his cult after Strange had removed White's influence over her. White gave her a choice to either watch his sorcerers kill Dr. Strange or accept her powers. Topaz promised to break White in half when she got free of her powers. When Strange arrived at the meditation center he took out the first sorcerer on the ground level with ease then levitated up to White's floor. White sent his magically imbued apostles against Dr. Strange. Topaz accepted White's magic powers to aid Dr. Strange against White's apostles. Dr. Strange managed to defeat them to White's surprise, who thought Dr. Strange had already been defeated. White summoned Underchild while Strange put Topaz under a protective shield when he teleported White's apostles to Australia. With his benefactor Underchild besides him White was certain of Dr. Strange's defeat, but Strange countered their sonic attack by sealing their mouths shut with a magic spell. When Underchild began to merge White was as surprised as Strange when Underchild and the mystic energies spread among the people of New York City merged to form Dormammu. (Doctor Strange: Flight of Bones#4 - BTS) - Masked by the Underchild's powers White fled the meditation center while Dr. Strange fought and defeated Dormammu and avoided the influence of the mystic virus Strange had infected Underchild with. When White used his credit card to rent a room at a motel Wong was able to track him down in less than thirty minutes for Dr. Strange. Unaware Strange knew his whereabouts White ordered a pizza from his motel room. (Doctor Strange: Flight of Bones#4) - Excepting his pizza White opened the door for Dr. Strange, who hit him in the face with Underchild's swan sigil. Strange then threatened to press down on three very sensitive pressure points on White's head if he didn't remove the deadly magical powers from Topaz within ten seconds. White explained that he couldn't remove her powers without killing her because of the metal charm next to her heart, which he had put there because Underchild didn't want Topaz to survive, and that any magical attempt to remove it would kill her. It could only be removed surgically according to White. After learning this Strange teleported White to Australia (everything worked out fine in the end and Strange possessed a doctor to remove the charm and then possibly made White remove the powers or maybe Strange did it...we don't know).